The Borrowers are Arriety Clock (Aisling Loftus) Pod (Christopher Eccleston) and Homily (Sharon Horgon) th ey are a family that lives under the floorboards of James Millman’s house. James is boy is having a rough time. His mother has recently died and they’re in the middle of a recession, which has forced James and his father to move in with James’ Grandmother (Victoria Wood). The grandmother has contacted a Professor (Stephen Fry) and alerted him to the Borrowers presence, the family, are then forced to go on the run with a fellow Borrower and tour guide, Spiller (Robert Sheehan). This is essential Christmas TV and on at the perfect time, complex and exciting enough to keep the children interested and simple enough to keep the adults watching, after a taxing day of dinner and being woken up at 4am to open the presents. 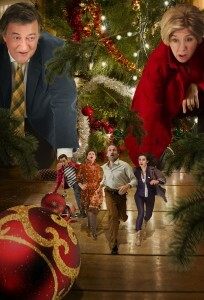 The Borrowers airs on Boxing Day, 7:30pm on BBC1.